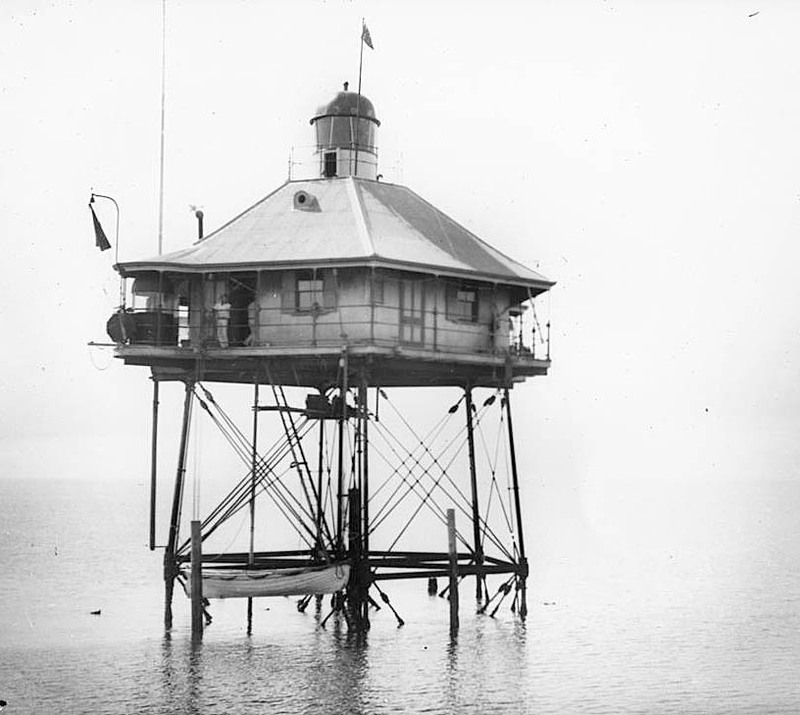 Moreton Bay Pile Light | Lighthouses of Australia Inc.
Relocated after a new channel was cut, struck by a barge in 1945, the Moreton Bay Pile Light came to its end when the British tanker Wave Protector crashed through the light in 1949. 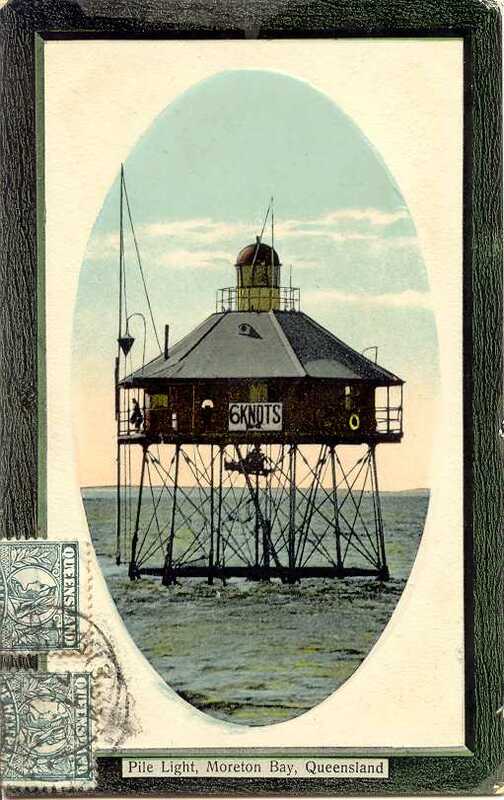 Moreton Pile light at the mouth of Brisbane River was built in 1882. The river, obstructed by a shoal before, became open when a channel was dredged through the bar. The lighthouse fulfilled two functions. The first was to mark the seaward entrance to the port of Brisbane through the newly dredged Francis Channel. The channel was also marked by two other lighthouses on Fisherman Islands, by beacons along its whole length and by a light boat at its port end. The lighthouses were manned by keepers who lived in adjacent living quarters. The second function was to keep the record and signal the state of the tides to the passing ships. Different colours were designated to specific levels of the tide and changed manually. Floats in tubes attached to graphs recorded the tides and when replaced every 31 days, the results were sent to Greenwich for keeping. When the bar became blocked once again, a new cutting was opened in 1912 and the pile light had to be moved to a new position. The original platform was left where it stood with a new small light attached to it. It was eventually destroyed in the 1960s. 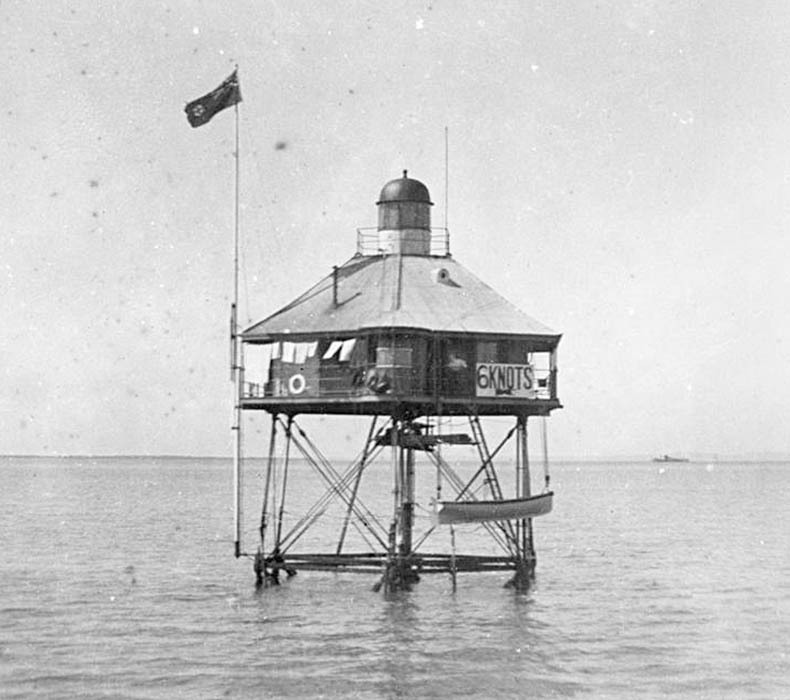 The 4th order light was moved with the lighthouse and continued to signal the state of the tides; red during ebb and flashing during flood tides. On 3 March 1945, the pile light was severely damaged when a US refrigerated barge in tow of a tug collided heavily with the pile. 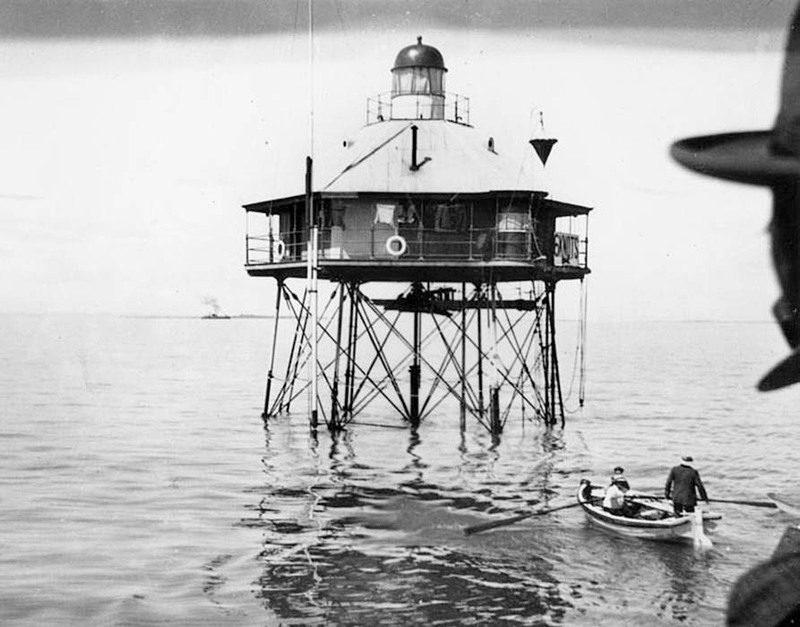 Though some damage remained on the steel structure, the lighthouse was soon repaired and returned to service. Its end came about four years later on 17 October 1949. The 15,000 ton British tanker Wave Protector failed to stop and crashed through the lighthouse. Its three inhabitants were thrown into the sea but escaped drowning when they were saved by the tanker’s crew. The damaged structure remained at its place until 1966/67, when it was removed by a barge Hammerhead. The tower is no longer in situ.